With the evolution of semiconductor technology and global diversification of the semiconductor business, testing of semiconductor devices to systems for electrostatic discharge (ESD) and electrical overstress (EOS) has increased in importance. ESD Testing: From Components to Systems updates the reader in the new tests, test models, and techniques in the characterization of semiconductor components for ESD, EOS, and latchup. Provides understanding and knowledge of ESD models and specifications including human body model (HBM), machine model (MM), charged device model (CDM), charged board model (CBM), cable discharge events (CDE), human metal model (HMM), IEC 61000-4-2 and IEC 61000-4-5. Discusses new testing methodologies such as transmission line pulse (TLP), to very fast transmission line pulse (VF-TLP), and future methods of long pulse TLP, to ultra-fast TLP (UF-TLP). Describes both conventional testing and new testing techniques for both chip and system level evaluation. Addresses EOS testing, electromagnetic compatibility (EMC) scanning, to current reconstruction methods. Discusses latchup characterization and testing methodologies for evaluation of semiconductor technology to product testing. 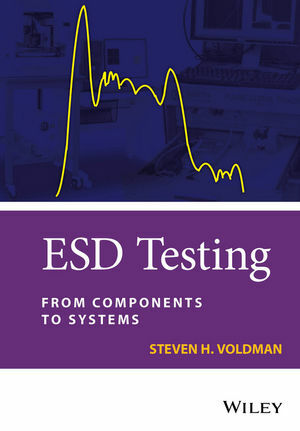 ESD Testing: From Components to Systems is part of the authors’ series of books on electrostatic discharge (ESD) protection; this book will be an invaluable reference for the professional semiconductor chip and system-level ESD and EOS test engineer. Semiconductor device and process development, circuit designers, quality, reliability and failure analysis engineers will also find it an essential reference. In addition, its academic treatment will appeal to both senior and graduate students with interests in semiconductor process, device physics, semiconductor testing and experimental work. Dr. Steven H. Voldman is the first IEEE Fellow in the field of electrostatic discharge (ESD) for "Contributions in ESD protection in CMOS, Silicon On Insulator and Silicon Germanium Technology." Voldman was a member of the semiconductor development of IBM for 25 years as well as a consultant for TSMC, and Samsung Electronics. Dr. Voldman initiated the first transmission line pulse (TLP) standard development team, and a participant in the JEDEC-ESD Association standards harmonization of the human body model (HBM) Standard. From 2000 to 2013, as Chairman of the ESD Association Work Group on TLP and very-fast TLP (VF-TLP), his team was responsible for initiating the first standard practice and standards for TLP and VF-TLP. He initiated the "ESD on Campus" program which was established to bring ESD lectures and interaction to university faculty and students internationally; the ESD on Campus program has reached over 40 universities in the United States, Korea, Singapore, Taiwan, Malaysia, Philippines, Thailand, India, and China. Dr. Voldman teaches short courses and tutorials on ESD, latchup, patenting, and invention.